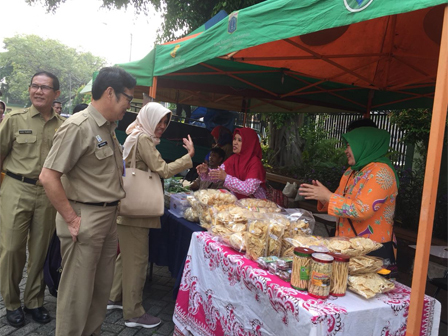 " We offer a variety of culinary such as processed fish, farms and vegetables whose buyers are not restricted"
Jakarta Maritime, Agriculture, and Food Security (KPKP) Dept. is holding cheap market on the yard of Jakarta KPKP Dept. office, Jalan Gunung Sahari Raya, Central Jakarta, for two days. Jakarta KPKP Dept. Head, Darjamuni said 30 coaching traders under his dept. are participated in the market. "We offer a variety of culinary such as processed fish, farms and vegetables whose buyers are not restricted," he expressed, Tuesday (6/5). For the price, is cheaper than traditional market, ranging from broiler chicken sold at Rp 35,000 per chicken, beef Rp 95,000 per kilogram, chicken egg Rp 23,000 per kg. "There are also processed milk from cattle ranchers, fresh fish and salted fish that are sold starting at Rp 10,000," he explained. In the meantime, Ani Puspita (36), a citizen of RT 09/03, Gunung Sahari Selatan admitted she came to the cheap market to buy basic commodities. Its existence is very helpful to the people in fulfilling the needs of basic commodities at affordable prices. "I buy processed fish food like nuggets and otak-otak (fish cakes) sold at Rp 12,000, surely this is very cheap," he adm itted.